« Spring is really coming! 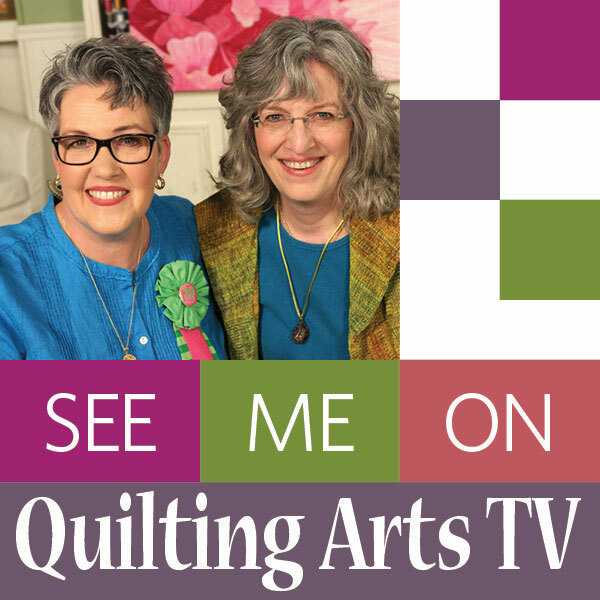 Today’s post is about a new pattern I’ve designed to help folks who want to start art quilting or for folks who are experienced art quilters but want an appealing yet fairly easy pattern. The class to teach Birch Pond Seasons (when I get winter and spring made, I’ll have four views of the same pond across the four seasons) for the first time went swimmingly well as you’ll see by the photos! The pattern itself will be available in about two months (guessing…have to send it away for printing the large sheet this time). 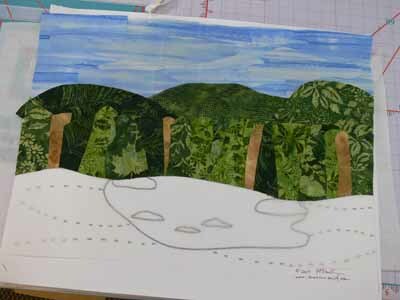 As you might guess by that rather extended absence from the blog, I’ve been busy! Between the first draft of my next article for Machine Quilting Unlimited magazine, getting together the stuff for taxes (not only ours but mom’s, too…bleah), attepting to get some sleep, going to wrestling meets, the usual family and household stuff, making a new small quilt for the article, and teaching, I’ve been rather behind the curve. 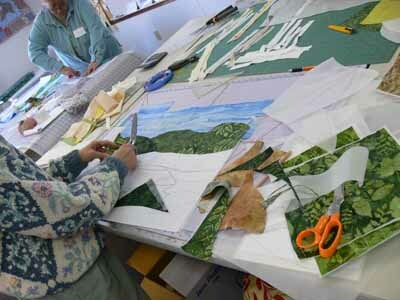 A while back, I got to teach my Birch Pond landscapes pattern for the first time at Maine-ly Sewing, and it was a gas! I will definitely be polishing up the instructions, sending the pattern off for printing (it’s oversized, and copies at Staples are about 6 times more expensive than shipping it away and getting it professionally printed). 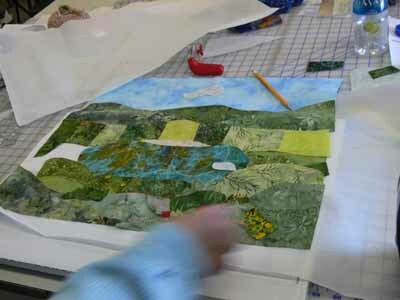 After showing the students how to fuse up fabric (both large chunks and smaller bits) they began composing their quilts. 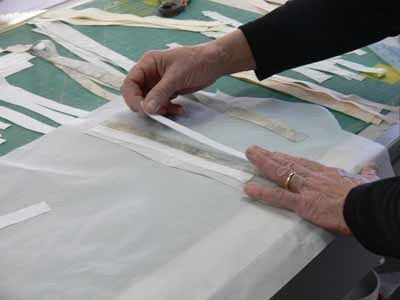 The easiest way proved to be setting out the large pattern (the piece of paper is about 18×22), placing parchment paper on top of the pattern, then the pre-fused fabrics on top of the parchment. 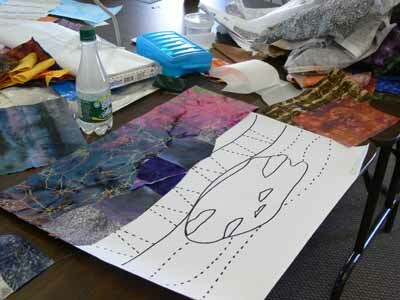 Here you can see the pattern through the parchment on the lower half of this quilt. 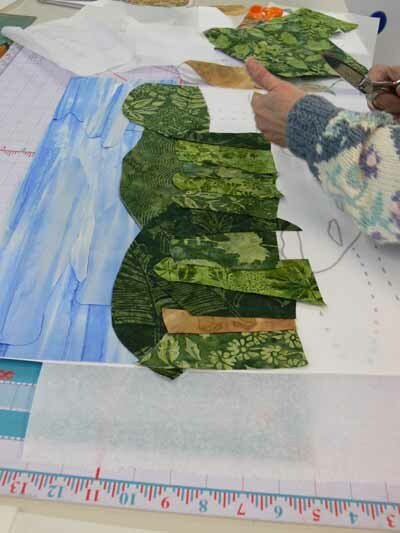 This student did a fabulous job with her sky; she had one piece of fabric that was perfect, but WAY too narrow, so we cut, spliced and overlapped for it to look like a summer’s cloud-dotted sky. 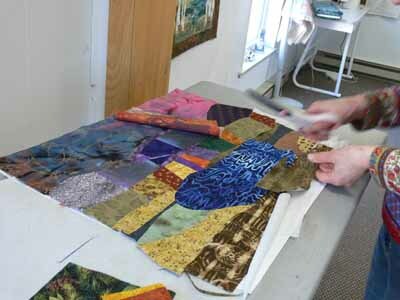 Using strips to create new "fabric"
At the end of the day we discussed border selection, quilting designs (the ones on my quilts, which you can see here, are designed to be do-able by newbie machine quilters), and using a facing to finish the edges. 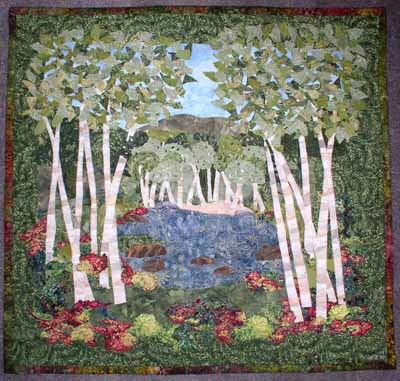 This entry was posted on Monday, March 16th, 2009 at 3:31 pm	and is filed under art quilting, Inspiration, Machine applique, Machine Quilting, Patterns, Teaching / Classes, Techniques, Tutorials. You can follow any responses to this entry through the RSS 2.0 feed. Both comments and pings are currently closed. 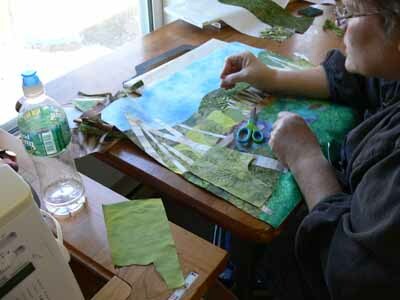 Love the details in your quilts. Reminds me of a favorite drive in Acadia National Park – Park Loop Road around the beaver pond. The birch trees are beautiful. Oh, I just love the different work of the students! 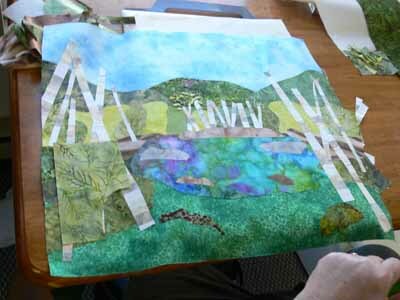 It makes me want to do a landscape of my Mom’s cabin on Lake Michigan…Birch trees, lake and cabin…that is doable…. 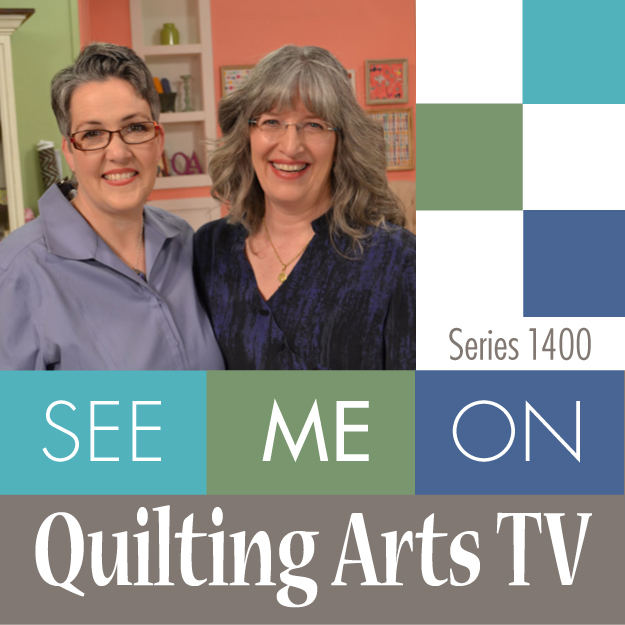 What a great class – wish I could do it! 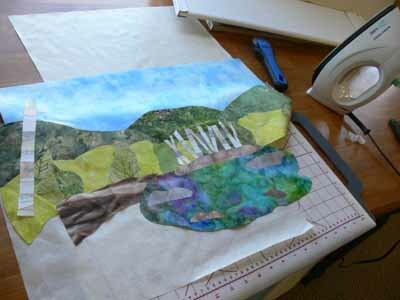 Love watching the landscape quilts come together. As I watch I actually start feeling like maybe one day, I can do one of them too. Love how it all meshes!! 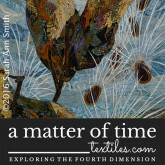 It is coming – one day I’ll feel like I’ve picked up enough info to do one. Thanks for all your excellent pictures.